This Flashing Sign Supply With Neon LEDs Comes With Wall and Ceiling Mounts! Red, Green, and Blue Lights are Great for Grabbing Customers' Attention! Purchase Sign Supplies With Confidence! 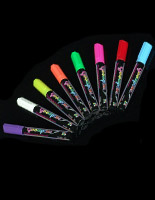 Multi-colored flashing LED lights create colorful, customized messages! 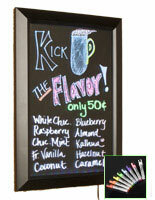 Write-on surface allows users to create custom messages! Hardware included for wall-mounting or suspending from ceiling! Black 21" x 14" writing surface lets the marker colors stand out. 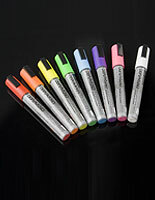 This discount sign supply for fluorescent marker pens uses edge-lit LED illumination technology. Edge-lighting gives uniform distribution of illumination across the complete panel, without "hot" or "cold" spots. This strip of lighting is alongside one edge of the exhibit, and illuminates your composed subject matters. Every LED illumination is red, blue or green. Once you've plugged in this sign supply, you are able to select from thirteen varying lighting plans! 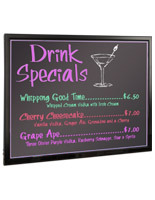 If you want all colorings flashing, or merely plain colored text, this sign supply has it all! Watch the short video beneath to view all the varying preferences for LED effects! This sign supply with lights is a compose-on blackboard. 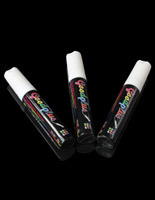 You are able to utilize any color water-based marker on the board; however utilizing a white water-based marker will provide you with the most brilliant outcomes. This sign supply that features LEDs can be wall-affixed or hang from the ceiling. Choose what is best for you! Your order of this sign supply that lights up also comes with a unique, non-abrasive towel to clean your fluorescent signage. 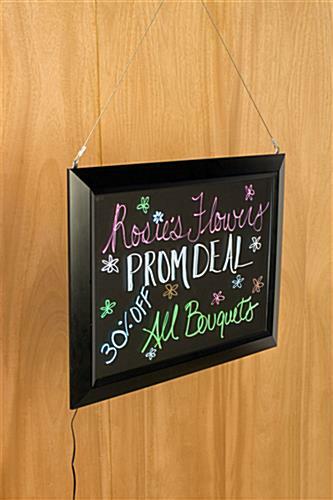 This sign supply is engineered to enthrall customers! Enchant them by lighting up your design. 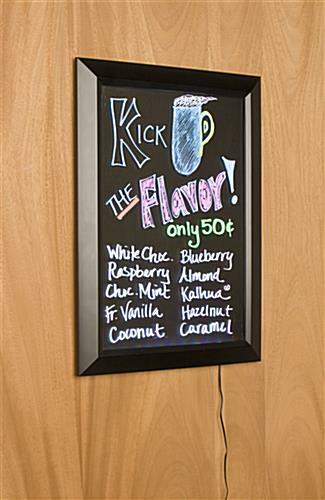 This contemporary sign supply with wall mounts, also recognized as a fluorescent signage, is an ideal option for an eatery menu to exhibit day by day specials, but could also be utilized in countless professional settings. Eateries, sports bars, and several other venues like to publicize utilizing these models. 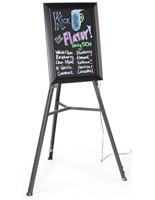 A write-on black sign supply gives sales supervisors or associates the freedom to build their own tailor made communication in a special and appealing manner! Compose or draw on this product, making your communication one-of-a-kind. This sign supply is truly special in that it has an LED lighting system to turn your subject matters into brilliant, colorful signage. Please Note: This neon board does not include a marker for writing. When you receive this board the instructions may say that a marker is included, but note that the board does not ship with any markers. 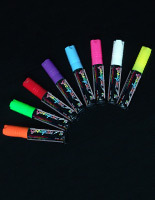 Please see related items to the right for marker options.